Electric Tower, or General Electric Tower, is a historic office building and skyscraper located at Buffalo in Erie County, New York. It is the seventh tallest building in Buffalo. It stands 294 feet (89.6 m) and 13 stories tall and is in the Beaux-Arts Classical Revival style. It was designed by James A. Johnson and built in 1912. Additions were made in 1923 and 1928. 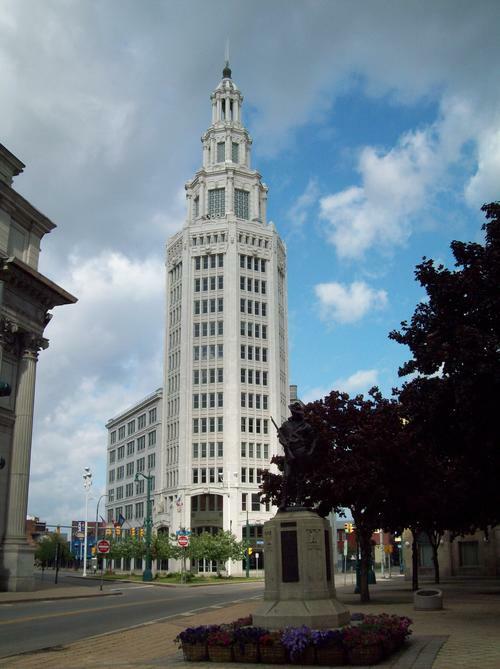 Inspired by the electric tower at the Buffalo Pan-American Exposition, the white terra-cotta clad was originally built as the Niagara Mohawk Building and features an octagonal tower which steps back three times to terminate in a large lantern. It is also known as Iskalo Electric Tower. The decorative symbols featuring aspects of electricity production are considered precursors to subsequent art deco design. Like One M & T Plaza, the spire of the tower is illuminated with different holiday colors at night throughout the year. Both buildings are illuminated blue and gold for the Buffalo Sabres during the National Hockey League playoffs. It was listed on the National Register of Historic Places in 2008.